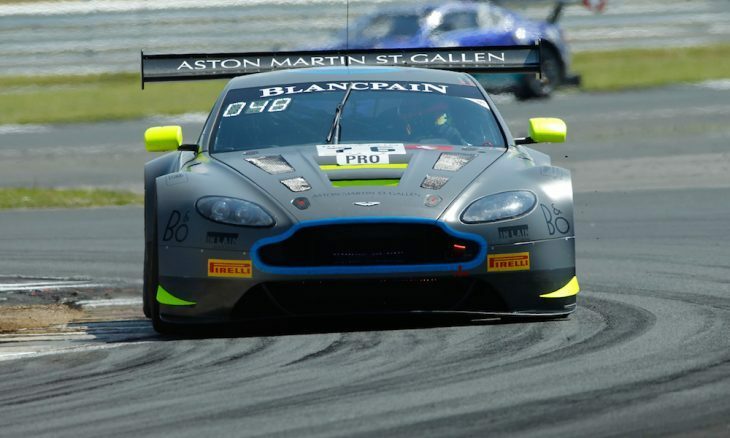 R-Motorsport will start from pole position for the second round of the Blancpain GT Series Endurance at Silverstone after Matthieu Vaxivière, Jake Dennis and Nicki Thiim, driving the #76 Aston Martin V12 Vantage lapped the 5.9kmm Grand Prix circuit in an average of 1:56.962, the only car to qualify in an average of less of 1:57. 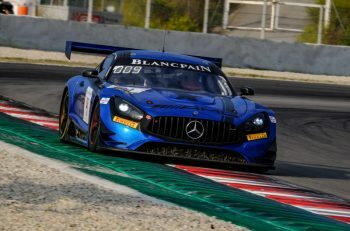 Joining the #76 car on the front row of the grid will be the #88 Mercedes-AMG Team Akka ASP Mercedes-AMG GT3 in which Tristan Vautier, Adam Christodoulou and Raffaele Marciello set an average lap time of 1:57.121. Completing the top three was the #14 Emil Frey Lexus Racing Lexus RC F GT3 with the driver line-up of Marco Seefried, Christian Klien and Albert Costa which qualified .1 of a second behind the #88 entry with an average lap-time of 1:57.221. Pole position in the Pro-Am category was taken by the #333 Rinaldi Racing Ferrari F488 GT3 piloted by Alexander Mattschull, Rinat Salikhov and Daniel Keilwitz who lapped in an average of 1:57.634. Pole position in the Silver category was set by the #54 Emil Frey Jaguar Racing G3 Jaguar of Alex Fontana, Adrian Zaugg and Mikael Grenier with the Am class pole going to the #188 Garage 59 McLaren 650S GT3 of Alexander West, Chris Harris and Chris Goodwin. Matthieu Vaxivière, who took the first session in #76 R-Motorsport Aston, laid down a marker when he put in a 1:56.637, comfortably the quickest lap of the weekend and over six-tenths quicker than Dries Vanthoor in the #1 Belgian Audi Club Team WRT Audi R8 LMS who finished second in the 15-minute session. The first session was briefly red-flagged after contact between the #54 Emil Frey Jaguar Racing entry and Henry Walkenhorst, at the wheel of the #36 Walkenhorst Motorsport Mercedes, resulted in a spin for the #36 car close to the pit lane entry. There was a further brief red-flag period in Q2 after Sandy Mitchell went off the circuit close to Becketts Corner in the #78 Barwell Motorsport Lamborghini Huracán GT3. R-Motorsport held provisional pole throughout the three sessions and looked to be on for a lock-out of the front row as Q3 progressed. 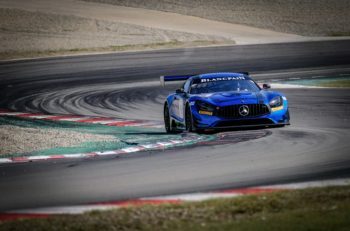 However Raffaele Marciello, at the wheel of the #88 Akka ASP Mercedes, put in the quickest lap of the final session with 1:56.683 to move to within two-tenths of the pole-sitter. 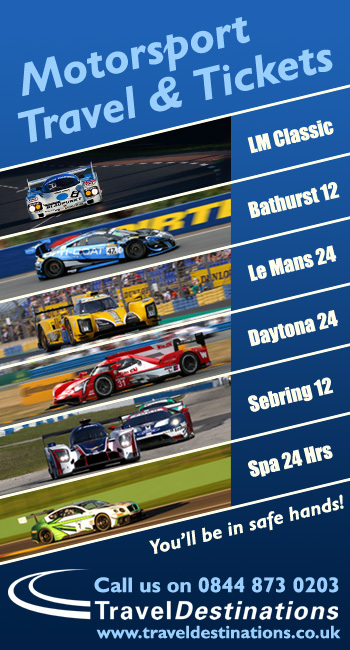 The #76 crew was delighted to have secured pole in only their second race together. The lights go out for the second round of the 2018 Blancpain GT Series Endurance Cup at 15:00 local time.